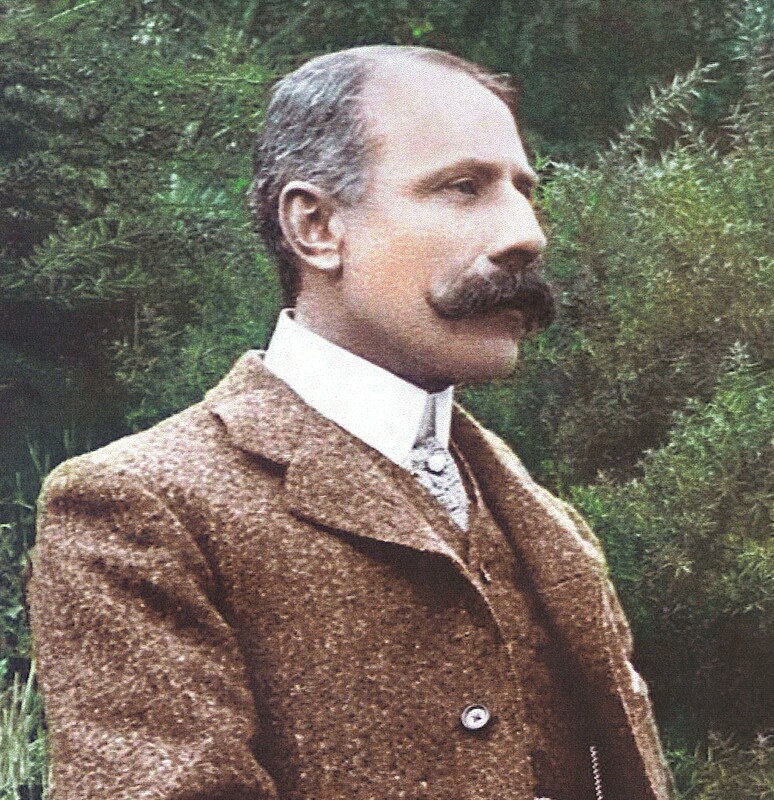 Elgar: the man behind all that pomp. Every time you wore a cap and gown, you heard this tune. It gets played at every graduation ceremony in the United States, probably even at nursery schools. You can hear it in your head right now, can’t you? BUMMM-bump-bah-bah-BUMMM-bum… Yes, that’s the one. As you may recall, it’s known as “Pomp and Circumstance”. That phrase means “a ceremonious, ostentatious display”, and let’s face it — graduations are rarely occasions for quiet reflection. As with so many other idioms in the English language, Shakespeare gets credit for this one: pomp and circumstance is part of a line from the third act of Othello. It was appropriated by an English composer named Sir Edward Elgar, who actually wrote five Pomp and Circumstance marches from 1901 to 1930. The one that gets our tassels shaking, though, is officially known as Pomp and Circumstance March No. 1 in D.
A section of it was worked into the coronation ceremonies for King Edward VII and it wasn’t long before people recognized the composition’s suitability for other pompous occasions. Elgar’s status as a composer led to his knighthood in 1904, which was quite a feather in the cap of someone who began his musical career as the bandmaster of something called The Worcester and County Lunatic Asylum. An Elgar admirer at Yale University seems to be responsible for Pomp and Circumstance becoming the theme music for graduation ceremonies in the United States. A Professor Sanford had arranged for Sir Edward to receive an honorary doctorate, and at the 1905 commencement, with Elgar in attendance, Pomp and Circumstance March No. 1 was played as the recessional. OK, remember how it went when you got a new TV, and then the neighbors suddenly all needed new (bigger) TVs? That’s sort of how it worked with Pomp and Circumstance. Some rival Ivy Leaguers must have been at Yale’s 1905 graduation and loved that march music, because Princeton used it in their 1907 ceremony — and not at the end, either; this time graduates marched in to that tune! That’s also where it appeared in the program at University of Chicago the following year, and in 1913 at Columbia, and in 1916 at Vassar. Within a few years Pomp and Circumstance had pretty well worked its way across the U.S., and has tenaciously hung on ever since. That is not the case in England, however. Patriotic lyrics had been attached to that melody long ago, and the song, known there as “The Land of Hope and Glory”, has become an unofficial second national anthem. For the English to use it as a graduation processional would be like graduates in the U.S. marching in to “My Country “Tis of Thee”. Oh… come to think of it, that is the same tune as “God Save the Queen”, which is the U.K.’s official national anthem. At any rate, Pomp and Circumstance has gotten students launched into the real world for over a century now; maybe it’s time to consider fresher alternatives. I know Tulane University uses “When the Saints Go Marching In”, and some schools could candidly recognize their graduates with “Wonderful World” (Don’t know much about history/Don’t know much biology…) Any other suggestions for a Pomp and Circumstance replacement march? This entry was posted in History and tagged Sir Edward Elgar. Bookmark the permalink. How about “Still Crazy After All These Years”? Lew and I used to play “It Don’t Mean a Thing” as the Pitzer College new graduates marched out. Arlo Guthrie’s “Unemployment Line” would strike a responsive chord, as it were, with many of the new graduates. My son is an audio producer, and the beat which he has created can actually be the new theme for graduation ceremonies all over the United States. However, I am not cognizant of the right contact individual(s). I am sure we would need to consult with the music industry in addition to the Board of Education. Could you please assist us in this matter? The beat is someone like the current beat, but has an obvious different tone, and can actually be the next graduation ceremonial beat for the next centuries. You may either respond via email or contact me via phone at 678-978-9859-cell, 678-222-2095-work or 770-222-6203-home. Thank you. I played the star wars The Throne Room for my sisters graduation in 1979. It was awesome. People complained so it wasn’t repeated the years I went to school. Maybe now people are more open to something new. This is a great one.